Elizabeth Deel is a board certified psychiatric and mental health nurse practitioner at Austin State Hospital. She has been employed at Austin State Hospital since October 2015. She has been working intensively with the intellectual and developmental disorder (IDD) population as a part of an interdisciplinary treatment team since February 2016. She became the primary attending clinician on the inpatient unit for individuals with IDD in August of 2016. 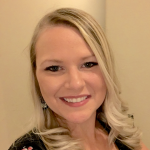 Prior to becoming an advanced practice nurse, she worked as a researcher and earned a Master’s Degree in cellular and molecular neuroscience at Vanderbilt University Medical Center studying the underlying molecular pathology of absence epilepsy. She also completed the Howard Hughes Medical Institute’s Certificate Program in Molecular Medicine while pursuing this degree. Through this clinical immersion program, she was introduced to clinical science and decided that making an impact through patient care was a much better fit than basic scientific research. She attended Vanderbilt University School of Nursing’s Psychiatric and Mental Health Nurse Practitioner program and graduated in August 2015. She is currently an active participant of the St. David’s Foundation Public Health Corps and a member of the American Psychiatric Nurses Association. Disclosure: Megan Elizabeth Deel has no relevant financial relationship(s), potential or perceived, with commercial or conflicts of interest to disclose.